One of my favorite things about Christmas is baking cookies. I bake lots of cookies, and give cookie gifts to my friends and co-workers. I've got some that I always make (candy cane cookies, brownie drops and melting moments) and some that vary from year to year. 1. Push 3 marshmallows onto the sticks. The stick should come about 3/4 of the way through the top marshmallow(the head), but should not poke all the way through. The marshmallows should be touching each other (no gaps in between). I liked mine, as you can see, with the stick through the flat sides, but they also look quite nice with the flat sides facing out. 2. Melt white chocolate according to the package directions in a medium bowl. 3. Working quickly, dip marshmallow pops into the white chocolate. The marshmallows need to be completely covered, or they will get hard and they won't look nice. Shake slightly to allow excess to drip off. Place on waxed paper. While the chocolate is still wet, add chocolate chips for eyes, nose and buttons. 4. Allow chocolate to set. Peel from waxed paper and wrap in cellophane. Tie with ribbon and store in a cool place. Adorable! 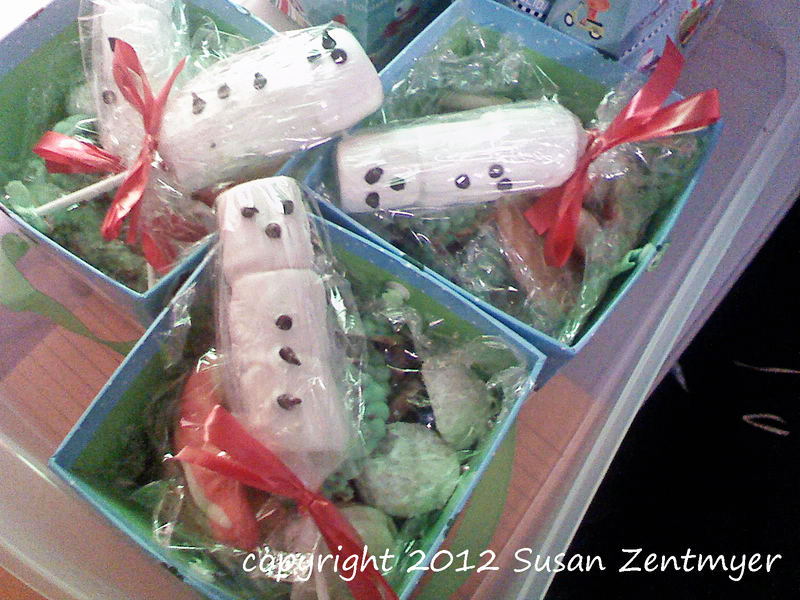 These were a big hit in last year's cookie boxes, and I look forward to making them again! I'm a sucker for snowmen--and you made the cutest ones! This is such a cute and lovely idea!